1. Vs. O God, come to my assistance! Rs. O Lord, make haste to help me! Glory be to the Father, etc. 2. On the 6 large (single) beads say: "My Jesus Mercy" and the "Glory Be"
3. On the 33 small beads say: Vs. Arise, O Lord, and let Thy enemies be scattered. Rs. And let them that hate Thee flee before Thy Holy Face. 4. O God, our protector, look on us and look upon the face of They Christ. O Lord, show us Thy Face! And we shall be saved! O Jesus, who in Thy bitter Passion didst become "the most abject of men, a man of sorrows," I venerate Thy Sacred Face wheron there once did shine the beauty and sweetness of the Godhead; but now it has become for me as if it were the face of a leper! Nevertheless, under those disfigured features, I recognize Thy infinite Love and I am consumed with the desire to love Thee and make Thee loved by all men. The tears which well up abundantly in Thy sacred eyes appear to me as so many precious pearls that I love to father up, in order to purchase the souls of poor sinners by means of their infinite value. O Jesus, whose adorable Face ravishes my heart, I implore Thee to fix deep within me Thy divine image and to set me on fire with Thy Love, that I may be found worthy to come to the contemplation of Thy glorious Face in Heaven. Amen. Eternal Father, I offer Thee the adorable Face of Thy Beloved Son Jesus for the honor and glory of Thy Name, for the conversion of sinners and the salvation of the dying. O Lord, who in the most Holy Shroud, which enfolded Thy adorable Body on being taken down from the cross, hast left manifestations of Thy presence here below and evident tokens of Thy love, by merits of Thy holy passion and out of regard for this venerable linen which served for Thy burial, mercifully grant, we beseech Thee, that in the resurrectionwe also may share in that glory, in which Thou shalt reign for all eternity. Amen. The little chaplet of the Holy Face has for its object the honoring of the five senses of our Lord Jesus Christ, and of entreating God for the triumph of His church. This chaplet is composed of thirty-nine beads, six of which are large, and thirty-three small, and a medal of the Holy Face. It is well to recite it everyday, in order to obtain from God, by means of the Face of His well-beloved Son, the triumph of our Mother the Catholic Church, and the downfall of her enemies. The thirty-three small beads represent the thirty-three years of the mortal life of our Lord. The first thirty recall to mind the thirty years of his private life, and are divided into five sixes with the intention of honoring the five senses of the touch, of the healing, of the sight, of the smell, and of the taste of Jesus, which have their seat principally in His Holy Face, and of rendering homage to all the sufferings which our Lord endured in His Face through each one of these senses. Each of these senses is preceded by a large bead in honor of the sense which it is intended to honor and is followed by a Gloria Patri. The three small beads recall to mind the public life of the Saviour and have for their object the honoring of all the wounds of His adorable Face, the large beads which precedes them has the same object in view. The "Glory be to the Father" is repeated seven times, in order to honor the seven words of Jesus upon the Cross, and the seven sorrows of the Immaculate Virgin. The Medal and the Holy Face: Sister Pierina, a holy nun who died in 1945, in many visions was urged by the Blessed Mother and Jesus Himself to spread the devotion to the Holy Face, in reparation for the many insults Jesus suffered in His Passion, such as to be slapped, spit upon and kissed by Judas, as well as now being dishonored in many ways in the Blessed Sacrament by neglect, sacrileges, and profanations. She was given a medal which on one side bore a replica of the Holy Shroud and the inscription: "Illumina, Domine, vultum tuum super nos" (Ps. 66-1) "May, O Lord, the light of Thy countenance shine upon us." On the reverse side was a radiant host with the words: "Mane nobiscum, Domine" - "Stay with us, O Lord." After great difficulties, Sister Pierina obtained permission to have the medal cast. Even the expenses for the casting were miraculously met when she found on her desk an envelope with the exact amount of the bill - 11,200 lire. The Evil Spirit showed his chagrin and rage at the medals by flinging them down and burning the pictures of the Sacred Face and beating Sister Pierina savagely. In 1940, when the Second World War had the world in a turmoil, Italy saw a wide distribution of this medal. Relatives and friends saw that their soldiers, sailors, and aviators were provided with the replica of the Holy Face since the medal was already famous for its miracles and countless spiritual and temporal favors. In Our Blessed Mother's own word, the medal is a weapon for defense, a shield for courage, a token of love and mercy which her Divine Son wished to give the world in these troubled days of lust and hatred for God and His Church. Devilish snares have been set to rob the hearts of men of their faith while evil spreads the world over. Genuine apostles are few. A divine remedy to all these evils will be the adorable Face of her Son, Jesus. Whoever wears this medal and, if possible pays a weekly visit to the Blessed Sacrament on Tuesday in a spirit of reparation for the outrages received by the Holy Face of Our Blessed Savior during His Passion and those bestowed on Him everyday in the Sacrament of His divine love, will be granted the gift of a strong Faith and the grace to fly to its defense conquering if need be all interior and exterior difficulties. Moreover, they are promised a happy death with special assistance of Christ Himself. The very first medal of the Holy Face was offered to our glorious Pontiff, Pope Pius XII, then the whole wide world got aquainted with this special object of favors and devotion. It is to be found on land and sea. Never has it been that a prisoner of war wearing this bandage of salvation has been executed. Our Blessed Lord also requested that a special feast be instituted to honor His Holy Face on Shrove Tuesday. resembles the Agonizing Crucifix. 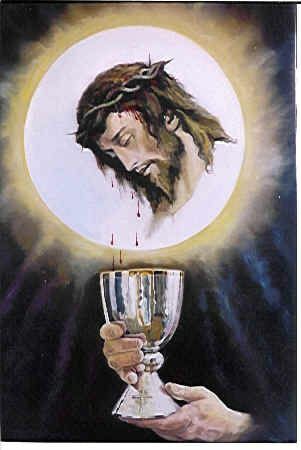 In a message Our Lord gave that commission for an artist to produce this image and makes similar properties comparable to the ones given for those who use the Sacred Agonizing Crucifix. From the messages given to Barnabas, Jesus revealed that His long-expected Kingdom of God on earth, or the Glorious Reign, has now been land. This is the Kingdom Christians pray for in Our time. Great events beyond human imagination, as in Matt. 24:22, are about to unfold. God is preparing to unleash the Great Tribulation that will purify the Church and the world through a series of disasters are inevitable because of the magnitude and into man's iniquities. Since the Precious Blood is the price paid for man's salvation, it is no wonder that rescuing the world from the powers of darkness time will be accomplished by the infinite merits of a mysterious weapon. From what is emerging, Christ wants to establish a location where His love will come to experiance to some degree what He went through in Jerusalem on that fateful Good Friday. This is why the land where this renewal of the world is starting will have the main features of the Passion of Christ, from the Garden of Gethsemane to the point of the Crucifixion. 1. An adoration super structure, the Holy Temple with twelve compartaments, that will take given time 36,000 worshippers and a sanctuary, with an appropriate altar, to accommodate priests con-celebrating. 2. A Way of the Cross to depict - The 14 major stations as observed, Church A 15th station with the Image of Resurrected Christ. All stations will carry art objects of personalities and instruments of Christ. 3. Garden of the Scourging at Pillar. 4. The site of Crowning with Thorns. 5. The Rock of Gethsemane, believed to belong to the original one in Jerusalem at the time of agony. This network of stones has always been on this land. 6. An artist's image of Christ praynig at the Rock of Gethsemane (to be cast in stone). 7. Adjoining the Rock will be the Life of Perfection, a circular structure with compartaments for sitting and to be connected with a rotating monstrance for perpetual adoration of the Blessed Sacrament. 8. Priests and Religious House. This structure, with administrative offices, is being developed by the Nigerian apostolate along the Stations of the Cross. 9. The Fountain of Calvary. Jesus promises healing and deliverance through the miracles will commence from the date to be by the Lord Himself. The Singaporeans have single-handedly developed this spring, with a grotto like the one at France. The accompanying art wroks, namely, a giant Agonizing Crucifix and a statue of the Immaculate Concepcion (Our Lady of Lourdes), are also being sponsored by the Singaporeans. This fountain is one of the features which when commissioned is bound to attract many devotees and pilgrims to this retreat ground. Also known as the Rock of Gethsemane, or simply as the New Jerusalem by many of the village transporters, the Holy Land of Reparation, Renewal and Adoration of the Most Precious Blood of Our Lord Jesus Christ is situated in coal-rich Enugu, in the heart of Igboland of Nigeria, Tucked through the mystic Barnabas, and was readily granted by the local chieftains. Easily one of the largest, if not the largest, this budding pilgrimage center will soon become Africa's best-known ground. The land, accessible only through a dirt, thirteen-kilometer-long winded road, is rich of various types, trees and springs. It easily lends itself, in its undulation topography, to the adaptations for which an ambitions development plan has been mapped out by architects and engineers at6 an estimated cost of US $36 million. One unfolding mystery of this great project manner in which professionals of different faiths are united in their enthusiasm to make it, some of them are offering their services voluntarily. The key structures as outlined to Barnabas by Our Lord Jesus Christ in many elaborate messages Include.